The perfect pinwheel cookie for apple lovers. 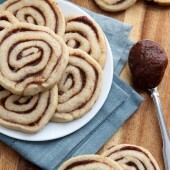 A light cookie, sweetened with a spiral of cinnamon apple butter. In the bowl of a stand mixer, cream together butter and sugar until light and fluffy. Mix in egg, followed by salt, baking powder and cinnamon. Finally mix in flour, until no streaks remain. Cover and chill dough 1-4 hours or until thoroughly chilled. Play dough between two sheets of wax paper. Roll out dough into a large rectangle, to roughly 1/4-inch thick. Spread apple butter in a thin layer over prepared dough, leaving 1/2-inch space around the edges. *If necessary, chill dough 30-60 more minutes if dough is too soft to roll. Roll dough rightly, pinching edges to seal. Wrap in a new sheet of wax paper. Chill 24 hours. Slice cookies 1/4-inch thick, spacing 2-inches apart on prepared baking sheet. Transfer cookie sheet to freezer for 5-10 minutes. Bake for 10-12 minutes or until edges are just golden. Allow cookies to rest on baking sheet for 1-2 minutes before transferring to a wire rack to cool. *Rolled dough may be stored within two large straight sided glasses or wrapped in a cardboard paper towel insert, to keep its rounded shape. Alternately rotate dough log occasionally in fridge. *Dough is soft, chill as needed.